Pioneers in the industry, we offer precimar ulm l-e calibration measuring instruments, precimar plm 600-e precision length measuring machine, marshaft scope marshaft scope 350 / 700 / 1000 plus, marshaft scope universal, fully automatic optical shaft measuring system, marshaft scope 600 plus 3d floor standing unit and margear gmx 600 universal measuring center for gear, form and dimension testing from India. The successful combination of gear and form measurement in one clamping saves additional investment, maintenance costs and time. Full functionality as a form tester up to an outer diameter of 600 mm. 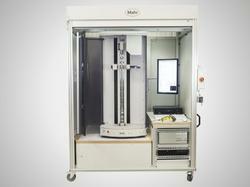 The MarGear GMX 600, as a complete solution, can also be used for measuring crankshafts, camshafts and pistons. 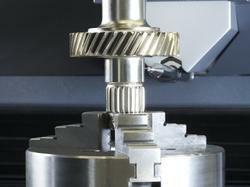 High precision, fully automatic testing of gears and gear cutting tools. 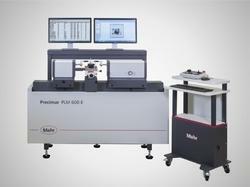 Also serves as an integrated formtester system solution. 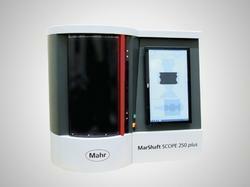 High precision 3D scanning sensor combined with directly driven C axis for accuracy and efficiency. 5 axis Power PC control unit with fully automatic swivelling probe head. 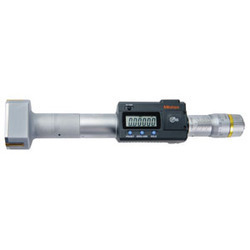 Enabling 0.1μm resolution measurement, this micrometer is ideal for customers who need to make highly accurate measurements with a hand-held tool. 1 and high-accuracy screw machining technology to reduce the instrumental error to ±0.5μm, delivering higher accuracy without sacrificing operability. *1. Patent pending in Japan, the United States of America, the European Union, and China. 2 enable more stable measurement, while the clicks emitted while the workpiece is being measured assure the operator that measurement is proceeding normally. 2. Patent pending in Japan, the United States of America, the European Union, and China. • Body heat transferred to the instrument is reduced by a (removable) heat shield, minimizing the error caused by thermal expansion of the frame when performing handheld measurements. features:· IP65 (water-proof) protection level that enables use in the presence of cutting fluid.· A large-character LCD display.· Storage of 2 preset values for use when setting to an inside length standard.· A function lock that prevents accidental changing of the reference setting during measurement.· An output port for measurement data that enables inclusion in a statistical process control or networked measurement system. Refer to page A-3 for details.· Ability to use Interface Input Tools that enable conversion of measurement data to keyboard signals that are then directly input to cells in off-the-shelf spreadsheet software such as Excel. - Top-of-the-line digital caliper. Solar type caliper with no battery and IP67 protection assures waterproof reliability. - With no annoying origin restoration necessary, a measurement can be started any time and there is no restriction on operating speed. - The impact resistance of the display unit has been increased for improved usability in workshop conditions. - Waterproof function makes this SuperCaliper suitable for use in an environment containing large amounts of cutting fluidor coolant. Operability is equivalent to the mechanical type caliper. - This SuperCaliper uses components that do not contain harmful substances and is compatible with RoHS Directives. - Slider operation is smooth and comfortable. IP67 protection levelLevel 6Dust-proof No ingress of dust allowed. Level 7Protected against water penetration. Ingress of water in quantities causing harmful effects shall not be possible when the enclosure is temporarily immersed toa depth of 1 meter in water under standardized conditions of pressure and time (30 min.). Max. response speed UnlimitedThis model is not waterproof type. Therefore, rustproofing shallbe applied after use. - Excellent accuracy of (1.1+0.6L/600)m with 0.1m/0.4m resolution/repeatability.- High-accuracy Height Gage incorporating a wide range of measurement functions.- To achieve best-in-class accuracy, a highaccuracy reflective-type linear encoder and high-accuracy guide are used.- Measurement can be implemented by iconbased commands that also support easy onekey operation.Perpendicularity (frontal) of 5m and straightness of 4m are guaranteed.- The TFT LCD provides excellent visibility and operability. - Pneumatic full/semi-floating system allows adjustment of air-cushion height.- Basic statistical functions are provided and, additionally, RS-232C data output provides the option of evaluating measurement data externally with SPC software on a PC.- For precision Black Granite Surface Plates- Backup/Restore of data and measurement part programs can be implemented using USB storage devices (FAT16/32 format compatible). - Solar powered An environmentally friendly measuring instrument that does not require batteries,eliminating the hassle and cost of battery replacement. Can operate under minimum light conditions of 40 lux-lower than thelevel in a warehouse. - User-friendly buttons All functions can be accessed by using the two or three large buttons on the front of the indicator.- Origin recorded even if display disappears. The indicator includes an ABS (absolute) sensor that allows the previously set origin tobe restored even if the display disappears due to insufficient light, making it easy to resume measurement. This feature makes ID-SSideal for long-time or multi-point measurement. ID-SS to be used for about 3.5 hours under light conditions below the minimum level. ID-SS to fully recharge under light conditions of 500 lux. 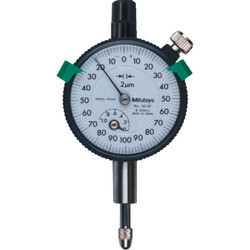 Mitutoyo's dial indicators have long been used by many of our customers. In full recognition of their needs, we have devoted ourselves to the research and development necessary to produce high-quality and high-accuracy dial indicators. Due to the recent re-acknowledgement of the importance of measurement technologies, the demands on dial indicators are many and varied installation in measuring jigs, mounting in countless types of precision equipment, etc. We offer numerous models with various types of dial faces, measuring ranges, graduation styles and environmental resistance ratings. The stems, which ensure the fixture reliability, and the spindles, which are the basis of accuracy, have excellent resistance against hard use thanks to the hardened stainless steel construction. 0.01mm resolution dial indicators have a grand gear made of stainless steel with high resistance to wear and deformation. 0.001mm graduation dial indicators employ a sector gear made of a special alloy in order to further increase the resistance to wear. S-type dial indicators employ an O-ring to ensure the air tightness between the outer frame and the crystal case in order to prevent water or oil penetration. Important factors in choosing a dial indicator the size (bezel diameter), resolution (graduation) andmeasuring range. Use the table on the right to help choose a suitable model for your application. Dial Test Indicators- Designed to probe surfaces that cannot be reached with a normal dial gauge. Useful both for alignment and for measurementpurposes. 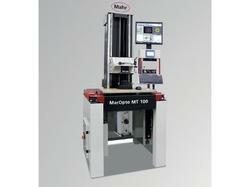 - Mitutoyo's proprietary new design permits smoothpointer operation. - Strong frame provides excellent rigidity and durability.- Non-magnetic pointer and contact point permit reliable operation even in magnetic environments. - Clear and concise wide dial face allowsexcellent visibility. - The surface of the crystal is hard-coated for excellent scratch resistance. - Flat crystal makes graduations easy to read. Moreover, the O-ring sealing method used for the bezel prevents water or oil penetration. (Note that this type is NOT waterproof. )- Six types are available horizontal, horizontal (20 Degree tilted face) vertical, parallel, universal,and pocket, allowing users to select the model most suited to their needs. Horizontal (20 Degree Tilted Face) Dial face inclined 20 Degree, compared with the vertical type, allows easy reading. 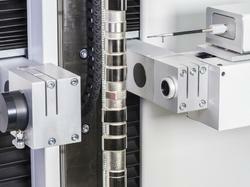 Vertical Best suited for centering holes under the spindle of a machine tool. Parallel The scale can be read from the front, with the stylus pivoting in a plane parallel to that of the dial face. Universal The direction of the probe movement can be freely changed. - Dial test indicators with a ruby contact point are available in the horizontal (standard) type. Several times more resistant to wear than carbide. Can be used on electrical discharge machines without special precautions. 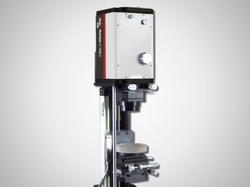 - SD series facilitates mounting on jigs, tools, and small machine tools to enable accurate positioning. - Built-in absolute scale including the ABS point requires no zero-set every time the power is turned on. In addition, reliability has improved thanks to elimination of overspeed errors. resistance of the display has improved. The SD-G series offers dust/water protection level IP66.- Long battery life for easier maintenance.- EC counters are available as external display units.- Equipped with an output port to transfer measurement data. This allows implementation in control systems and gaging systems. * To activate the hold function when using SD-D or SDV-D, an optional hold unit is required. Simultaneousactivation with the output function is not available. SD-G are also available to special order. * These units use 1.5V silver oxide cells for the power supply. Therefore, when the units are directly fixedto the frame of a machine tool that requires a high voltage, malfunction such as display digit fluctuationsand errors may occur. The countermeasure examples are described in the user manuals provided. inclusion in a statistical process control or networked measurement system. Resets the ABS origin at the current spindle position tothe minimum value of the measuring range and switchesto ABS mode. A brief press on the ZERO/ABS button sets display tozero at the current spindle position and switches to theincremental (INC) measuring mode. A longer press resetsto the ABS measuring mode. Equipped with output port for transferring measurementdata to a Statistical Process Control (SPC) andmeasurement system. The reading on the LCD disappears after this instrumentis idle for about 20 minutes, but the reading andmeasurement mode are retained. Turning the spindlecauses the reading on the LCD to reappear. In case of an overflow on the LCD or a computing error,an error message appears on the LCD and the measuringfunction stops. This prevents an instrument from givingan erroneous reading. Also, when the battery voltagedrops to a certain level, the low-battery-voltage alarmannunciator appears well before the micrometer becomes unusable. • Titanium-coated measuring pins provide excellent durability and impact resistance and allow the instrument to measure right to the bottom of a blind hole. • One SR44 battery is required and battery life is approx. 1.2 years under normal use. • ABSolute and INCremental measurement modes allow highly efficient operation. • The IP65 protection rating allows the instrument to be used in the presence ofsplashing coolant. • Measurements can be made close to the bottom of a blind hole. • Deep holes can be measured by attaching an extension rod (optional). • Measurement data output enables operation with Statistical Process Control (SPC) and measurement control systems. Refer to page A-3. • An interface input tool is available for transferring measurement data, under keyboard control, directly to commercial spreadsheet software. Refer to page A-5. 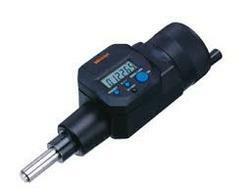 • These gages are designed to measure the diameters of very small holes. The radial displacement of the split-ball anvil is converted to axial displacement of the measuring rod, which is shown on the dial indicator. • Alternative indicators may be used in place of those recommended*. * Some indicators and protection covers cannot be used with these bore gages. 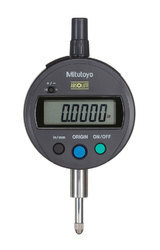 Contact a Mitutoyo sales office if considering the use of dial or digimatic indicators other than the commended models. • An optional stand (215-120-10) is available for efficient measurement of multiple small holes. Metric models: 4μm Inch models: .00016"
Repeatability Metric models: 2μm Inch models: .00008"
- Double-column structure ensures high measuring accuracy.- Ergonomic base fits comfortably in the hand.- Bidirectional touch-trigger probe is available as an optional accessory.- Character height of the LCD display has been increased (10mm to 11mm) and a highcontrast LCD display unit adopted, so that the readability is improved.- Inclined handle improves slider ergonomics. - Allows integration into statistical process control and measurement systems.- Battery SR44 (1 pc), 938882. For initial operational checks (standard accessory)- Battery life is 3,500 hours in continuous use.- Carbide-tipped long scriber (No. 905200 with overall length of 150mm) is provided as a standard accessory. (Standard accessory scriber cramp No. 05GZA033)- For precision Black Granite Surface Plates. Origin-setting (ABS measurement mode) Any arbitrary value can be stored as the origin point. Displayed value can be set to zero at any arbitrary position of the slider. Previously set origin is restored when switching back to ABS mode. Presetting (ABS INC measurement mode)Displayed value can be set to any arbitrary value, including negative values. Measuring directionMeasuring direction can be switched at the press of a button. Data holdDisplay value can be held. Reverts to ABS or INC mode when cancelled. Alarm Error message is displayed when overflow or overspeed of displayed value arises and measurement isstopped. Data outputAllows integration into statistical process control and measurement systems. Fine and coarse height adjustment through knob and wheel combination.Slider height adjustment wheel allows fine and coarse height adjustment. When battery voltage becomes low, a warning appears in the display. An adjustment is applied to the raw measurement data to compensate for the effect of the size of the sphericalcontact point used by the bidirectional touch-trigger probe. Pull the fine-adjustment knob out to engage gearing andthen turn this knob, which then slowly turns the wheel. The i-Checker is specially designed to calibrate dial indicators, dial test indicators, and other electronic comparison gage headswith a stroke of up to 100mm (4"). -Adjustment of the measurement position is very easily accomplished because of semi-automatic measurement and fullyautomatic measurement functions. -Creates and prints out a simple inspection certificate.-Saves inspection results as a CSV file for analysis by software. position with the jog-dial. Because of this function, measurement time is reduced and user fatigue is practically eliminated. Additionally all functions necessary for inspection are combined in the control box so that the operator need not rely on excessiveeye movement to adjust the pointer. The Automatic Measurement function, in tandem with a digital indicator makes the spindle move sothat measurement data is acquired automatically.Therefore, manual adjustment to the measurement position is unnecessary and the efficiency of every inspection is enhanced. Create and printout a simplified inspection certificate It is possible to create, edit and print out your own inspectioncertificate. Furthermore, that data can be saved as a CSV file. -Each model has a digital counter and digital readout protractor screen to facilitate dimensional and angular measurement. -High operability due to the layout of the builtin counter at an easily readable position. -Large handwheel enables easy height adjustment of the stage for setting the best surface illumination conditions. -Combination use with the optional 2-D Data Processor QM-Data200 facilitates a variety of dimensional measurement methods. The ideal solution for both universal and specialist gear manufacturing. System solutions provide the ultimate in flexibility and availability within a modern gear wheel component production facility. MarGear GMX, a networked variant for use close to the production area, offers fast and efficient analysis of possible gear deviations. This allows for a direct assessment of the deviation and an automatically generated machine error correction. Gear and form measurements carried out on a single measuring instrument. 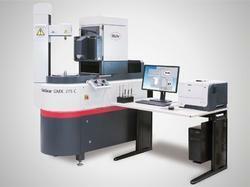 Fully automatic precision testing of gears and gear cutting tools up to an outer diameter of 400 mm. Fully automatic precision testing of long gear shafts and gear cutting tools up to an outer diameter of 400 mm. Extended Z measuring range for measuring long drive shafts up to 650 mm. transmission shafts up to 700 mm can be clamped. 3D geometries such as distances, cone angles, etc. 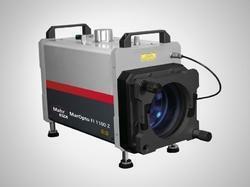 The MarOpto FI 1040 Z is a full-featured interferometer that can provide non-contact measurements of flat or spherical surfaces and transmitted wavefront of optical components and assemblies. The MarOpto FI 1040 Z is therefore ideal for measuring optical components such as flats, prisms, lenses or precision metal parts such as bearings, sealing surfaces and polished ceramics. Measurements can be made using simple basic visual fringe inspection, IntelliPhase static spatial carrier analysis, or phase-modulated interferogram analysis. The MarOpto FI 1040 Z offers flexibility and unprecedented performance to handle today's industrial applications. 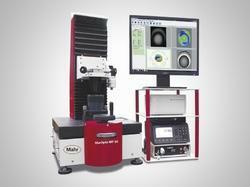 The MarOpto FI 1100 Z provides non-contact measurements of flat or spherical surfaces along with transmitted wavefront measurements of optical components and assemblies. Measurements may be made using basic visual fringe inspection, static fringe analysis, or phase-modulated interferogram analysis. The well-established IntelliWave™ software offers superior measurement and analysis capability. The MarOpto FI 1100 Z provides the versatility and reliability to handle today's advanced applications at unrivalled value for money. 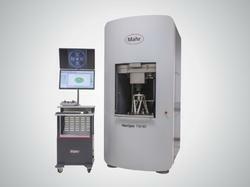 - Excellent accuracy of (1.1+0.6L/600)m with 0.1m/0.4m resolution/repeatability. 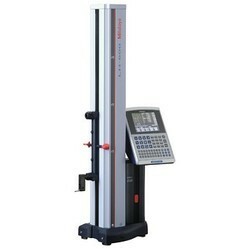 - High-accuracy Height Gage incorporating a wide range of measurement functions. - To achieve best-in-class accuracy, a highaccuracy reflective-type linear encoder and high-accuracy guide are used. .- The TFT LCD provides excellent visibility and operability. - Pneumatic full/semi-floating system allows adjustment of air-cushion height. - Basic statistical functions are provided and, additionally, RS-232C data output provides the option of evaluating measurement data externally with SPC software on a PC. - For precision Black Granite Surface Plates- Backup/Restore of data and measurement part programs can be implemented using USB storage devices (FAT16/32 format compatible). Mitutoyo offers 3 types of gauge block for use as length standards rectangular steel, rectangular ceramic(CERA Blocks) and square steel gauge blocks. In addition, rectangular and square protection blocks (1mmand 2mm for each) are available in tungsten carbide. Mitutoyo gauge blocks are recognized to be of thehighest quality both here in Japan and abroad, and are available in various grades to meet every need inrespect of working conditions, environment and application. As a world-leading precision measuring equipment manufacturer, Mitutoyo is certified by the Japanese government as anaccredited calibration laboratory, which means that the accuracy of its gauge blocks is guaranteed through traceability tothe Metrology Management Center of the National Institute of Advanced Industrial Science and Technology (AIST).Wringing Lapping measuring surfaces is one of Mitutoyo's specialties. Our advanced technique, developed over more than halfa century, enables us to achieve the optimum flatness and surface finish needed for gauge blocks and thus maximizethe wringing force. Abrasion Resistance and Dimensional Stability of Steel BlocksHigh-carbon high-chrome steel is employed to satisfy a variety of the material characteristics required for gaugeblocks. Our advanced heat treatment technology for steel blocks, which involves repeated temperature cycling,simultaneously achieves excellent abrasion resistance and minimizes any change in length over time. 1. Corrosion ResistantAnti-corrosion treatment is not required when handled normally (i.e. with fingers), resulting in simple maintenanceand storage. 2. No Burrs Caused by Accidental MishandlingSince the CERA Block is very hard, it will not scratch easily and is highly resistant to burrs. If a burr is formed, it caneasily be removed with a ceramic deburring stone (Ceraston). 3. Abrasion ResistantCERA Blocks have 10 times the abrasion resistance of steel gauge blocks. 4. Dimensionally StableCERA Blocks are free from dimensional change over time. 5. Clearly Marked SizesBlack characters, indicating the nominal length, are inscribed by laser and are clearly visible against the white surfaceof the block. 7. High Wringing ForceSuperior flatness and surface finish provides maximum wringing force.